This summer I’ve been eating more cherries than ever before. While I was not a cherry lover growing up, I don’t recall having fresh ones. At one time I loved maraschino cherries more than anything in the world, but after eating nearly a whole jar at about 8 years old, the love affair was over. I found Door County cherries at our local farmer’s market yesterday. Door County is in northern Wisconsin and is known for cherries; they are deep red, juicy, and tart. This cooler couldn’t be easier, and it would work well as a pitcher drink for a cookout. It would also do well with some vodka. 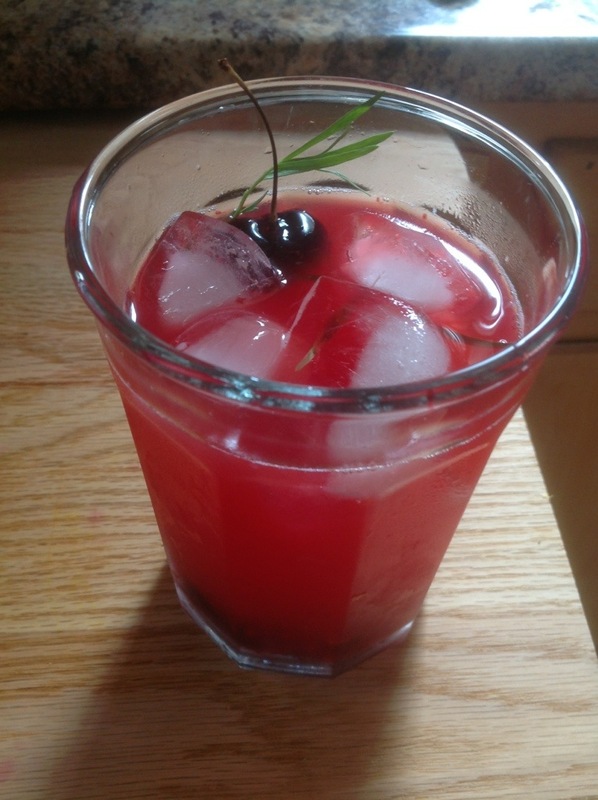 In a large glass, add the cherries and tarragon, and muddle until the cherries release all of their juice. Add ice and top with your favorite lemonade. If it’s not homemade, I like Simply Lemonade brand.